There are many different opinions out there on what purpose a blog serves—even within the contributors of this newly created one. Some blogs break news, some are commercials for new products, some offer "tips of the trade." For that, I say read the newspaper, or better yet, a trade magazine. I think blogs should offer real opinions on real topics that real people care about. And they should do so in the language of the people—a language that is evolving as fast as the social media outlets it is carried on. If you are a hater of technology and social media (AKA Web 2.0), you better get with the program soon. It is starting to affect every industry. In the hotel industry, travelers rely on social media sites for reviews of properties before they book. If you're looking to increase occupancy or identify some areas where your property could improve, I'd pay close attention to how travelers are communicating online. New technologies are also infiltrating the guestroom, and upgrading to include some of these new produ cts is a must. So, my personal goal for HotelTalk is to provide readers with a venue for real hospitality industry discussion. We can talk about why I like the $50-a-night Microtel in Youngstown, Ohio, better than the $500-a-night Waldorf=Astoria in NYC. We can discuss the coolest places to hold your convention. And we can talk about products I saw at HITEC that will never make it. Read about a lady who fell onto subway tracks and nearly died because she was texting here. Check out this 13-year-old student who wrote her entire English essay in text-message format here. Look at this lady who drove her $200,000 Mercedes into a river following GPS directions here. 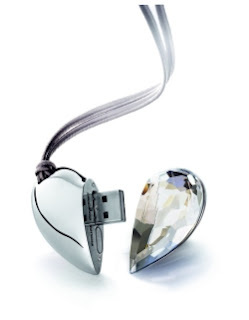 Review the perfect gift for your wife, a designer crystal USB drive here. And my favorite, read about the first virtual reporter working in Reuters' 'Second Life' bureau here.